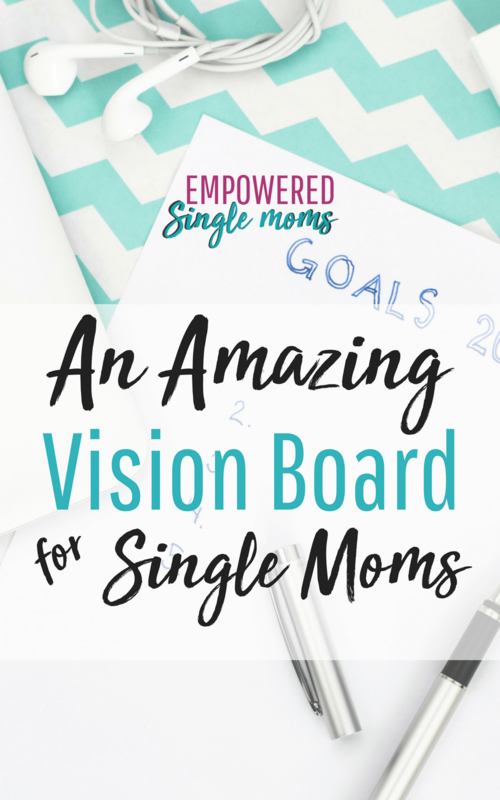 Are you wondering how to craft a new life as a single mom? 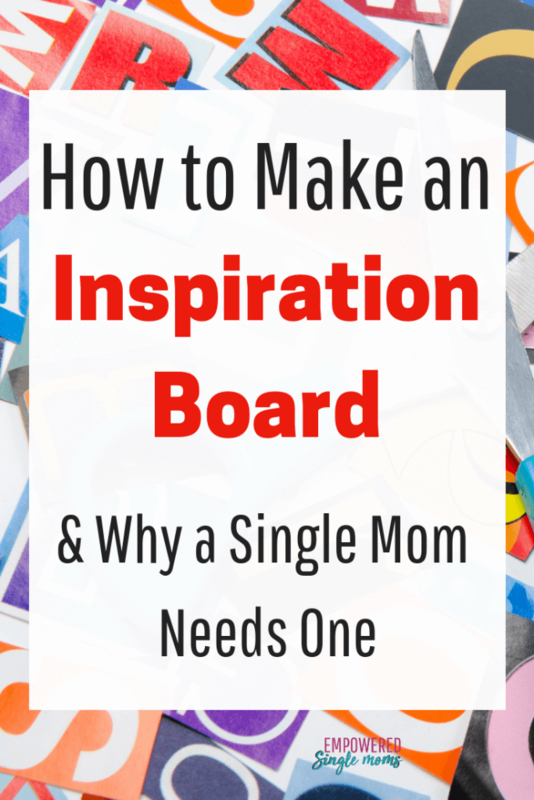 I have a simple answer: learn how to make an inspiration board! I no longer had the life I had planned. I had lost my perspective and wasn’t sure who I was anymore. A big part of my identity had been being a wife and mother. All of a sudden I no longer had the role of wife to help define me. My old dreams were gone. I needed new dreams, a new vision of who I was. I knew I needed a new plan, but I had no idea where to start. It seemed like all I could think about was what I had lost and what the kids had lost. How could I dream a new dream? Making an inspiration board is a great way to dream new dreams. 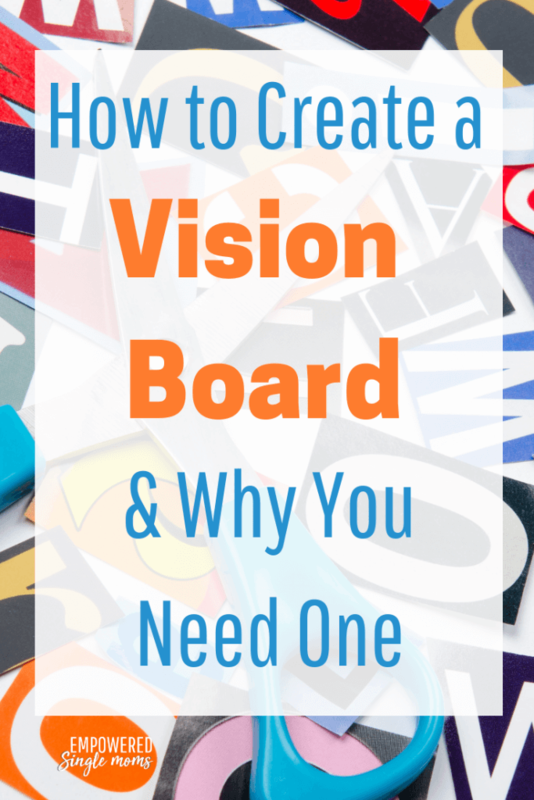 After a major transition, an inspiration or vision board can be a useful tool for creating a new life. Creating an inspiration board gives you a visual representation of the new life you want for yourself and your kids. It’s hard to let go of old dreams. When you have a new dream, it is much easier to let go of the old outdated dreams that don’t fit. Those old dreams are like those size 4 jeans you are keeping at the bottom of your drawer just in case you once again magically fit into them. It might happen, but it is more realistic to buy some jeans that fit or dream a new dream. An inspiration board is a visual representation of your hopes, dreams, and goals. It’s a helpful tool to keep you focused. Traditionally, an inspiration board is made with a piece of tag board and pictures cut out of old magazines. Some people make inspiration boards out of Pinterest or Trello boards. Personally, I like the physical representation of my dreams better than the digital representation. The act of cutting and gluing connects my brain and my dreams in a different way than a digital board. When some people explain how to make an inspiration board they tell you to start by looking at magazines. The idea is you will be cutting out things from old magazines and gluing them to a piece of poster board. That is one way to start, but I have a different suggestion. The first step is to make a bucket list of 100 things you’d like to do. Starting with a bucket list moves you beyond the day-to-day and really challenges you to think about what you would like to do with your life. It expands your ideas. I think starting with a bucket list gives you a lot more options than starting by looking at old magazines. I don’t know about you, but many of my dreams are seldom represented in a typical magazine. To make my inspiration board really fit my dreams I have needed to do several image searches to find what I was looking for. So, start by dreaming big. Doing a bucket list helps you to be clear on what your hopes and dreams are instead of being limited by what you find in the magazines you happen to have around your house or can scrounge up from the neighbors. Note: This post may contain affiliate links, and if you buy a suggested product I will earn a small commission. We are a participant in the Amazon Services LLC Associates Program, an affiliate advertising program designed to provide a means for us to earn fees by linking to Amazon.com and affiliated sites.” Read the full disclosure policy here. Do you need help with ideas for an inspiration board? It may have been so long since you have dreamed your own dreams that you don’t even know what you want. Sometimes when women are in a relationship they defer to their partner’s dreams. If that is you, I can help you get in touch with your own dreams again. Think about people you admire: friends, family members, or famous people, and human interest stories from the news or your Facebook feed. What is it that you admire? Have you heard about people doing things and thought, “There is no way I could do that”? Ask yourself “Why not?” Dare to put those things on your bucket list. Are you still having trouble coming up with bucket list ideas? Think about different categories. What would you like to be able to do physically? Run a marathon, compete in a triathlon, pole dance, teach yoga, bike 100 miles? What would you like to make? Knit your own sweater, make a special quilt, carve a bird out of wood, build a tiny house? What would you like to learn? Spanish, Chinese, photography, how to grow organic produce? What are some experiences you want to have as an individual? Eat lobster in Maine, hike the Appalachian trail, live in another country for a year, go on a month-long road trip? Your children will only be living under your roof for a limited amount of time. What kind of childhood memories do you want them to have? Do you want them to remember short local adventures? Is there a more extravagant trip you want to take with them? Do you want them to remember exploring local sites, and playing family games? Let yourself dream. You only have one life, so make it count. Don’t spend your one amazing life living someone else’s expectations. Reflect on your bucket list of 100 things. What themes do you notice? What have you learned about yourself? Now you are ready to pull out the magazines. Keep an open mind. Maybe you will see pictures of things that spur your imagination and you will want to add them to your bucket list. Cut out words and pictures that represent your dreams. Once you’ve gone through the magazines, are there things you still want to include? This is a great time to do a Google image search to find just what you are looking for or add a few words to your board. Once you have your amazing inspiration board made, make an action plan. Look at your board and your bucket list. Make three more lists. What do you want to accomplish in the next three years, next year, and next three months? Now choose something from each list that you want to make a priority. Break down each goal into specific action steps. Make a timeline for those action steps and put them on your calendar. Let’s say you want a different job. You identify the job you want, but it will require you to go back to school. Your first two action steps are to apply for school and apply for financial aid to pay for school. Schedule time on your calendar to do those two things. If you want to run a marathon, find a training schedule and schedule time to train. Even if you are only taking small steps, when you take them consistently you can accomplish great things. A financial example: when you save $84 a month, at the end of the year you will have saved over $1000. When you write 500 words a day, by the end of the year you will have written 182,500 words (an average novel is 75-120,000 words). Or if you want to read more books, think about reading ten pages a day and at the end of the year, you will have read 3650 pages. That would be about eight books read in a year at the pace of ten pages a day. Now you know how to make an inspiration board. As a single mom, you are in a position that necessitates you designing a new life. At first, this will seem overwhelming. Making a bucket list of 100 things you want to do and using an inspiration board to make a visual representation will give you a start at designing a new life. Don’t stop there. Prioritize your dreams by making a list of what you want to accomplish in the next three years, the next year, and the next three months. Then, break those dreams down into actions steps. Put those actions steps on your calendar as commitments with deadlines and be amazed at how much you can accomplish in a year.